Are you experiencing frequent bouts of intestinal distress ranging from diarrhea to intrusive intestinal symptoms? Is bloating, gas, flatulence, pain and sour stomach an every day occurrence? This cycle of intestinal issues may temporarily respond to anti-diarrhea medications or antacids but somehow continues to plague the sufferer. Diet alterations may temporarily provide some relief but one often finds it difficult to pinpoint the cause or the cure. Finally, by process of elimination, one is able to uncover the true culprit of the gastrointestinal distress and actually do something to bring about permanent relief. The offending substances, lurking in every day foods and substances are called sugar alcohols and they are often liberally used on a daily basis. 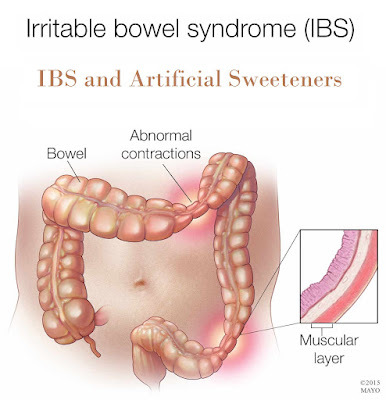 This group of artificial sweeteners are not only hidden in products we consume on a daily basis but trigger a host of gastrointestinal symptoms for anyone prone to irritable bowel syndrome (IBS) and for some who have never experienced gastrointestinal reactions before in their lives. The reason behind this gastrointestinal difficulty is mainly because Sugar Alcohols are not completely absorbed by the body. They are indigestible and passed through the digestive system, resulting in fermentation in the intestines. Fermentation results in gas, cramping, bloating and gastrointestinal distress. Warnings are often found on products containing these sugar alcohols stating "Excess Consumption may Result in a Laxative Effect." Naturally, this is not a preferable option for anyone dealing with the normal functions of every day living. Even for those who are not IBS sufferers, over consumption of these products may trigger abdominal discomfort, spanning from cramps to diarrhea. Dehydration may also be a risk factor if the laxative effect is strong. Stomach pains, gas and bloating are intrusive but simply eradicated when one recognizes the offending substance as listed on the label and immediately discontinue usage of such products containing these substances. - Immediately discontinuation of any product containing any one of the artificial sweeteners. - Opt for more natural products. - Choose whole foods over processed and refined products. - Check out labels on all products that are sweet or low sugar. - Choose natural sugar over artificial. Opt for smaller portions. In closing, it is up to you to be aware of the ingredients found in the products you select. Investigate whenever you experience gastrointestinal distress. Is it after you brush your teeth or use mouthwash? Is it shortly after using a specific product? Is it while chewing gum or using a cough formula or breath mint?